Welcome, from the bellringers at St. John’s, St. Peter’s and Sacred Heart, to the world of Bellringing in Bournemouth. 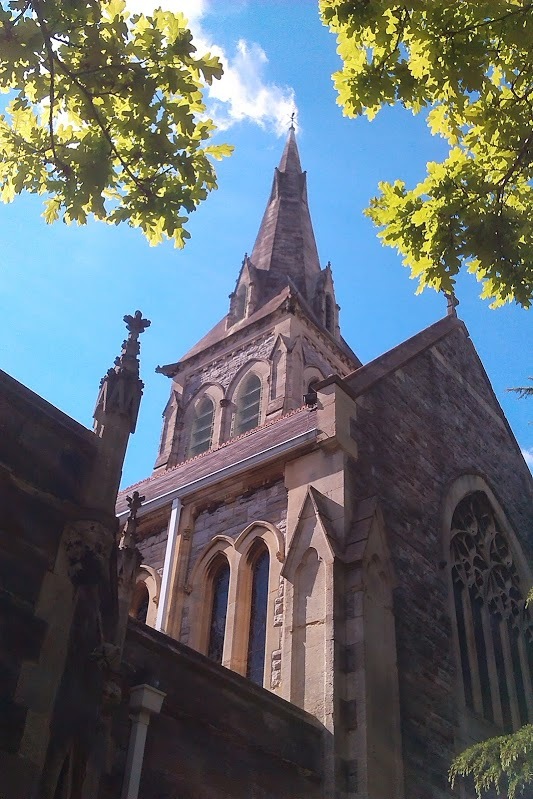 St John’s tuneful octave hosts practices weekly and holds a well attended 8 bell practice on the 2nd Tuesday which draws ringers from across the area. St Peter’s has a fine heavier ring of 8 in the centre of Bournemouth. The church is an outstanding example of high Victorian church decoration which extends into the ringing chamber. A rare ring of bells in a catholic church completes the Bournemouth towers with the light six at Sacred Heart within walking distance of St Peter’s. Each tower has its own band and practice night but the ringers support each other’s towers for extra ringing, weddings and services so if you are in Bournemouth you will be guaranteed a ring somewhere. St John’s has 2 steps up to the ringers’ entrance (the door facing the street) and a bell to ring if locked during practice night. There is a short staircase up to the ringing chamber. Sacred Heart has a short flight steps up at the main entrance (on Albert Rd) then a short spiral staircase up to the ringing chamber. There is a spacious gallery off the ringing chamber so room to spill out if you are waiting to ring. St Peter’s has a sweeping flight of steps up to the ringer’s (and main) entrance facing the road, and a bell to ring if you are late during ringing. The spiral staircase is the first door on your left inside; medium height. St John’s has ground floor toilets which are accessible during ringing. St. John’s has parking for a dozen cars behind the church, and on-street parking outside. St. Peter’s is next to a large public carpark in Upper Hinton Rd, and a footpath leads from the corner of the carpark directly into the top of the churchyard. See Dove Entry for map and coordinates. There is disabled parking in the Churchyard PLEASE contact the tower captain to arrange in advance. Sacred Heart has limited onstreet parking outside if you are lucky, otherwise see Dove entry for the recommended multi-story carpark, the Satnav destination will take you there. There is limited disabled parking PLEASE contact the tower captain to arrange in advance.